I think for the total full volume experience you should not try this with water, unless you have a good sized sample to play around with or you are lucky enough to have a full bottle open. This is a 95 pointer, mainly for the palate actually, if it went on everything overall it would be around 93 but neat palate wise it is an experience and worthy of a few more points. I think this is even more peaty than the Brorazilla 1972 DL Platinum and that is saying something! A nice blast of menthol, honey, peat, brine and faint hints of lemon but they are faint. You are fooled as you smell a basket of fruit gums but then you absorb the high alcohol content and you feel the fizz on the nose. The peat grows in the glass with air and subdues the fruit and finally some cake and pastry notes emerge. At first I thought this smelled much older than a mere 12 years and the longer you leave it the more pronounced the cake notes are but then there is a raw edge to the peat which is the indication that this is a relatively young one. Once again there is some dryness, and fruit emerges once more but the peat is brutal now, fizzing away and numbing your tongue. Massive, now with a few bitter wood notes and a little barley sugar but not particularly sweet barley sugar, just an edge so to speak. More restrained now still the fruit but the peat has a soft edge to it and now there is a nice brine note. On the palate the peat is still huge and the water has released even more but not as brutal, still some nice stewed fruit but there is also a dry bitter note now. Finish is still long, slightly sweet and of course peaty. 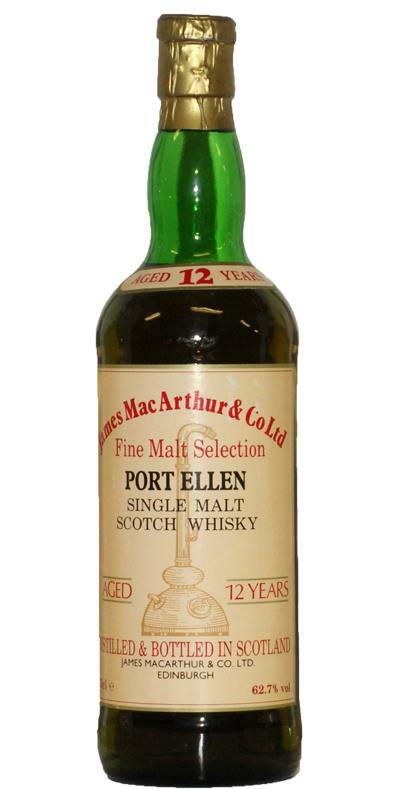 Very powerful Port Ellen. WoW!! Peaty and smoky, some flowery tones now and then. (seaweed maybe). Very rough nose. Very intense, lots of peat, quite dry, after that it gets a bit oilyer with vanilla and fruity on pineapple, green apples and some lemon. Medium long dry finish with some fruits at the very end of it.